While I tend to get super wrapped up in the latest makeup releases from my favorite brands, I get equally excited when they launch new tools as well. I personally believe that your makeup can only perform as well as your brushes— so the new e.l.f. 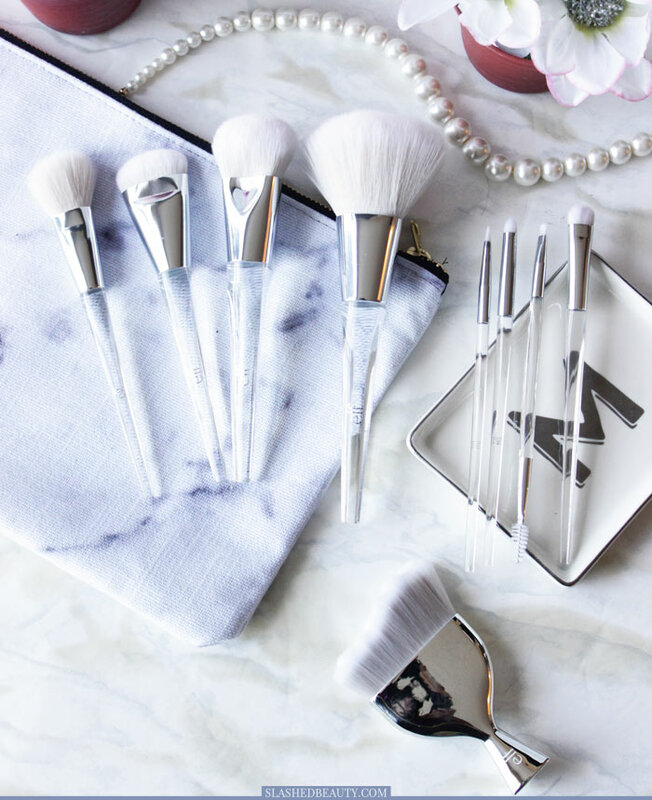 Beautifully Precise brush collection is giving me all the feels. 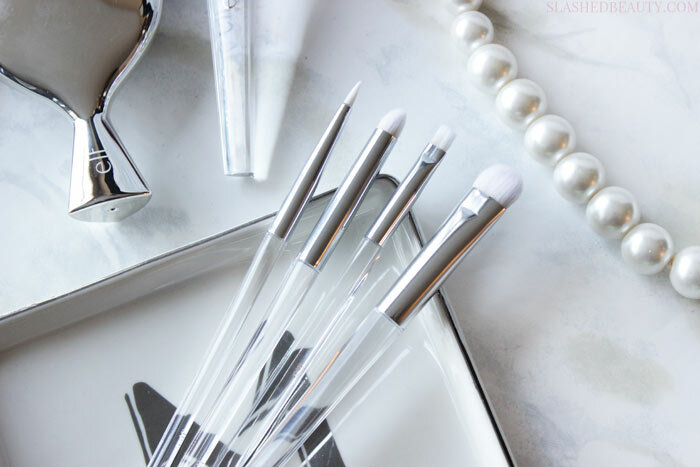 The new brushes feature triangular handles that are clear with silver accents, and extremely soft cruelty-free bristles that make application a breeze. One the years, e.l.f. has seriously stepped up their brush game, while keeping them affordable so you can really build your collection with all of the essentials. 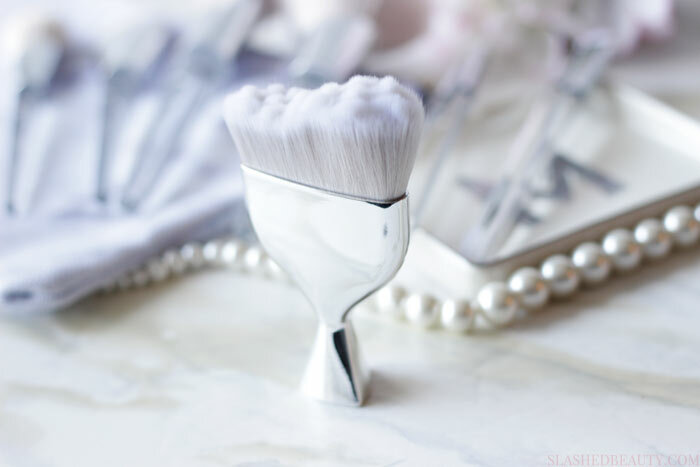 The Powder Brush ($12) is light and fluffy, which is great to use on both pressed or loose powders. This is perfect for my setting powder, since it dusts product evenly in a controlled manner. The Airbrush Blender ($10) is one of my favorites out of the new collection. It has dense but soft bristles that are tightly packed and angled for a flat side that makes liquid and cream foundation apply smoothly. The fluffier side helps buff out product for a perfect finish. The Sculpting Brush ($10) has stiffer bristles that are shorter and curved to help you get your contour on! The slim shape places product exactly where you want it, and the soft tips blend out powders for a seamless look. I’m not sure how I feel about the Airbrush Stipple Brush ($10) yet, which has a layer of dense bristles and a thin, longer layer of more flexible hairs to customize coverage. I typically use stippling brushes for my liquid foundation, but this brush is on the small side so it takes a while to blend out larger areas. The Eye Shadow Brush ($5) is your standard flat shader, though packed tightly enough to pick up a lot of product and layer color on well. The Dual Sided Eyebrow Brush ($5) is a staple in any collection, with an small slanted side for filling in the brows and a spoolie on the other end to groom and brush product through. The Smudge Brush ($5) is small, domed and tapers to a point to smudge and blend liner or precise crease colors. I’m loving it for applying shadow to my lower lash line. The Eyeliner Brush ($5) has been amazing for applying my gel liners. It has a very fine tapered tip and stiff bristles to get maximum control of where you’re applying product. It’s super soft as well, helping product glide onto the lid. The Multi-Blender Massager ($12) is the most unique brush in the collection, for sure. It is a short kabuki-style brush with curved bristles that shape tiny massage bulbs that are supposed to help blend in foundation, powder or bronzer. I really like the shape to get under the cheekbones for my contour, and the bulbs really help blend it out for a natural look. The prices of the new e.l.f. Precision Blush Collection are a bit higher than their original lines (think: Real Techniques prices) but their quality is also escalating. The ergonomic handles make them easy to handle and are, of course, so beautiful to look at. 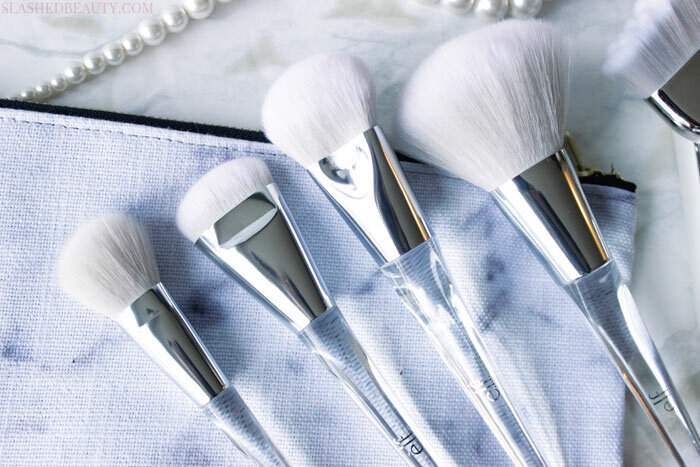 These are definitely e.l.f.’s softest brushes yet, as well. You can now find the Beautifully Precise Brush Collection exclusively on the e.l.f. Cosmetics website! Which brush are you dying to pick up? I’m glad to hear these are good. They’re very pretty. Ohhh my gosh, I might need these. That last brush is the weirdest thing I’ve ever seen! I’ve been looking at these often on the ELF site. I know I’ll pick up a few. These brushes are so pretty. My inner brush junkie wants all of them.